R Vivek was awarded the Man of the Match. Dindigul Dragons routed Siechem Madurai Panthers by 75 runs at the NPR College ground in Natham (Dindigul) on Thursday, Aug 9, in Qualifier 1 to book a spot in the 2018 Sankar Cement-TNPL final. 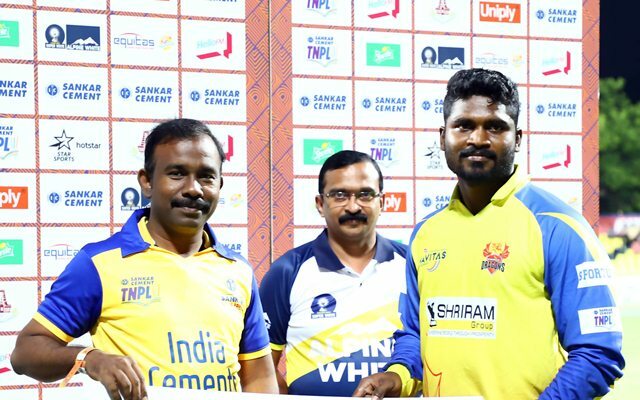 While the Dragons will travel to Chennai for the Aug 12 final at the MA Chidambaram Stadium, Madurai Panthers will meet the winner of tonight’s Eliminator between Lyca Kovai Kings and iDream Karaikudi Kaalai in Qualifier 2 to be played at the NPR College ground on Friday, Aug 10. Qualifier 1 began with the teams observing a minute’s silence in memory of former Tamil Nadu Chief Minister Kalaignar Dr M Karunanidhi. Put into bat first, Dragons got off to a flying start with Hari Nishaanth 57 (31b, 4×4, 5×6) and skipper N Jagadeesan 43 (34b, 6×4, 1×6) blasting 90 in just 9.1 overs. No 3 R Vivek then smashed 54 off 25 balls with two fours and six sixes. Spinner Varun Chakaravarthy was the standout bowler for the Panthers with 0/15 in his four overs. Dragons finished with the 2018 Sankar Cement-TNPL season highest total of 203/6 in 20 overs. Madurai Panthers lost batting mainstay KB Arun Karthik for 11 (4b, 1×4, 1×6) and collapsed to 128 all out. M Mohammed picked up 3-16 for Dragons. Dindigul Dragons 203/6 in 20 overs (H Nishaanth 57, R Vivek 54, N Jagadeesan 43, J Srinivas 3-42) bt Siechem Madurai Panthers 128 in 19.3 overs (Abhishek Tanwar 28, M Mohammed 3-16, Trilok Nag 2-17). Keep following CricTracker for more news and updates.